Counting down the day until you host Thanksgiving can be a little draining. If you want a way to prepare for your grand feast, then the free Thanksgiving Preparation Countdown is the way to do it. 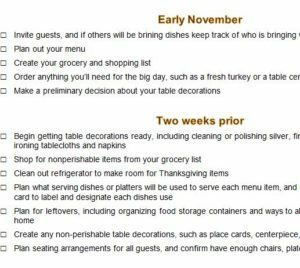 This simple checklist template has everything you need to prepare little-by-little to ensure that everything is ready to go by Thanksgiving Day. This means you won’t have to rush the day before and worry the entire time. The free template is a simple sheet that allows you to check off items as you complete them. By giving you a completely organized structure to work with, you’ll have Thanksgiving prepped and ready to go, the day before the event even begins. To download the free template document to your computer, just follow the link at the bottom of this page. The next step will be to change, add, or delete any items on the list that don’t fit into your routine for Thanksgiving. For example, one item on the list is “Find condiment dishes.” If you don’t use this item, then you would simply delete the task. Go through and change the items or add your own as you see fit. Now, as you approach the various timelines listed at the top of each section, you will go through and complete the items listed underneath. For example, in the “One Week Prior” section, you would complete the 4 tasks that are underneath. When Thanksgiving finally arrives, you might be left with nothing to do. If you’re ready to start the holiday season off the right way, and have a Thanksgiving to be remembered, then download the free template below.